From the Ballpark to the State Parks! PHOENIX – Spring training is just around the corner, and you can make the most of your Cactus League adventure by heading to Arizona’s state parks after the game! Whether you’re an Arizona resident catching a game or a visitor to the state, adding the parks to your rotation is sure to be a home run. There are plenty of parks to choose from, and all just a road trip away from the spring training facilities in the Valley. With camping, RV, and cabin options at 15 state parks, you can extend your visit and enjoy Arizona’s outfields. Head west to the Colorado River, where there are four state parks offering sunny relaxation and exciting things to do! Fishing, boating, and hiking are just a few of the activities offered on the beaches at Buckskin Mountain, River Island, Lake Havasu, and Cattail Cove state parks. Arizona’s famous red rock country is just a short drive north of Phoenix, near Sedona, Ariz. Fort Verde and Jerome state historic parks each offer tours through history, showing preserved artifacts and scenes from years past, in towns where there is plenty to explore! Red Rock and Slide Rock state parks place visitors in the heart of the world-famous red rocks. Looking for a homebase while you explore the area? Dead Horse Ranch State Park’s campgrounds and cabins are a cozy home away from home by the lagoon, with the Verde River flowing nearby. Southern Arizona offers its own adventures, from camping and hiking in Lost Dutchman State Park in Apache Junction, down to Patagonia Lake and Roper Lake state parks for camping and lake-front fun. 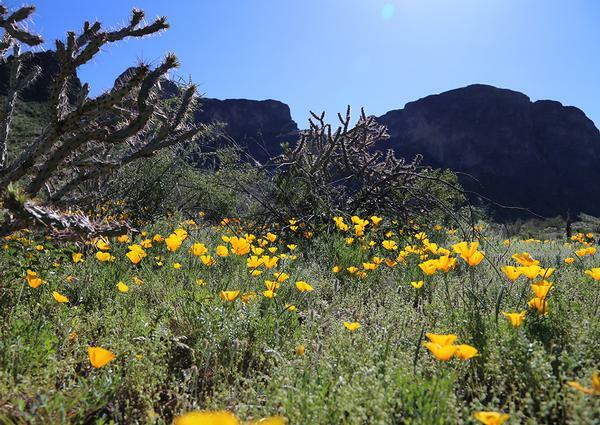 Catalina, Oracle, and Picacho Peak state parks also offer hiking trails ranging from moderate to difficult, with starry night skies, programs and events, and an amazing array of wildflowers! Create your road trip itinerary today, and turn your Cactus League experience into even more! To make camping or cabin reservations, visit AZStateParks.com/reserve. For information about all 35 Arizona State Parks and Natural Areas, the Trails and Off-Highway Vehicle Programs and State Historic Preservation Office call 1-877-MY-PARKS or visit AZStateParks.com.